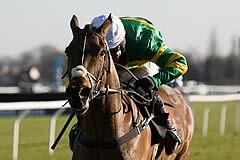 Minella Rocco's win in the National Hunt Chase was a record sixth success in the race for trainer Jonjo O'Neill - and his 26th training victory at The Festival in total. It was also a 45th Festival winner for Minella Rocco's owner J P McManus, who is the most successful owner in the meeting's history. Six-year-old Minella Rocco, a son of Shirocco, won by a length and a quarter from Native River at odds of 8/1. O'Neill said: "He's a massive big horse with a massive stride on him and you have to give him a bit of room [at a fence]. He [jockey Derek O'Connor] got him into a lovely rhythm, and he stays well. He's just a decent horse, isn't he? "I'd say the ground is key to him - decent ground is a big plus. It's been quite soft here a few times over the winter [he pulled up at Cheltenham in December and finished unplaced here in January]. He was a bit disappointing at Haydock [on his first run of the season, when he finished third of three in a novices' chase] - I thought he was good enough over two and a half miles and he wasn't." Commenting on his tremendous record in the National Hunt Chase, O'Neill said: "I've been lucky enough to have the good horses and the good lads riding them, which makes my job easy. It is great for the team at home, who put a lot of work in - it's great to see them rewarded. It's good to get one on the board on the first day and takes the pressure off a bit." Colin Tizzard could not hide his joy with Native River's run in the National Hunt Chase, after the six-year-old stayed on well to finish one and a quarter lengths behind Minella Rocco, at odds of 7/1. The Brocade Racing-owned son of Indian River was ridden by Michael Legg. Tizzard said: "I think he ran every bit as well as we could of hoped for, he jumped fluently and stayed four miles well. It was a lovely performance, I'm absolutely delighted. "He was just slightly lacking in pace, he was fifth or sixth jumping the last but he stayed on again well. He has done us proud." Commenting on where he might run next, Tizzard continued: "He will stay in novice company. We will probably try him at three and quarter miles at Aintree I would have thought. Michael (Legg) gave him a lovely ride, he did a damn good job." Katie Walsh, who finished third on the Willie Mullins-trained Measureofmydreams, who started at odds of 9/1, said: "The first mile he didn't jump that well and it took him a while to get going, but when he got going he was brilliant. "Top of the hill, I thought he was in with a chance of winning."